Building 429 came into the Christian Music scene in 2004 and found tremendous success in the rock/pop/inspirational/worship genre, receiving four Dove Award Nominations and winning in the category of "Best New Artist" for 2005. All success aside, though, these guys want their fans to know that they are real and truely believe that a relationship with Christ is the best thing there is. In 2000, frontman/guitarist Jason Roy and Scotty Beshears (bass) started a band that would focus on uplifting others. They felt so strongly about this that they named themselves after the Ephesians 4:29 verse, which says, "Do not let any unwholesome talk come out of your mouths, but only what is helpful for building others up according to their needs, that it may benefit those who listen." One year later, Paul Bowden (guitar) was added, and soon Michael Anderson (drums) joined. After signing with Word/Warner, the quartet released the band's first single, "Glory Defined," from their debut EP release, which carried the same title. It rocketed to the top of Christian Radio Weekly's AC chart in just three weeks - the fastest climb ever for a song in that category. 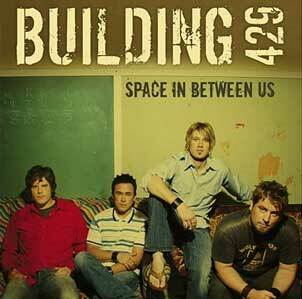 Other releases found success as well, fueling anticipation for Building 429's full-length album, Space In Between Us. The record hit stores in July of 2004. Although there are some shared songs between the two albums, the band feels that their full-length CD contains much better music. They hope the record will show people that, although we can't break through the divide between God and us, we have to be willing to make a leap towards it and trust that God will catch us and lead the way. As a result of the success of "Glory Defined," Building 429 found themselves with many touring and concert opportunities. They toured with Sonicflood, joined ZOEgirl, Tait, and Jump 5 for Shoutfest, and joined Todd Agnew, Barlowgirl, and Starfield for the In The Name of Love Tour with World Vision. This fall, they have been invited to tour with Jeremy Camp. Building 429 is very passionate about reaching young adults, and is currently working with Interlinc, a company dedicated to creating resources for youth pastors nationwide. Jason, Scotty, Paul, and Michael all recognize young adulthood as one of the most critical times in a person's life. It marks the point at which a person makes their faith their own, as well as deals with very challenging issues. The group wants to do all they can to help point people to Christ - which is the only place to find true peace and joy. This pursuit of God and grace is the heart of Building 429, and they make that clear with Space in Between. "At the end of it all," says Roy, "I hope someone says that we never settled for one side of the canyon, waiting for grace to reach for us. I want people to say that we were God chasers."